THE first-ever World Fair Trade tartan has been created to celebrate Scotland’s Fair Trade Nation status and will be presented to president WFTO, Rudi Dalvai, and Scottish Government, Minister for International Development, Alasdair Allan, on World Fair Trade Day, 13 May 2017, at the Fair Trade Fiesta – Ross Band Stand, Edinburgh. 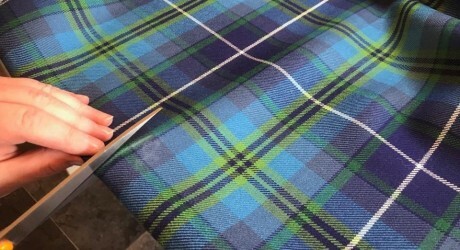 This officially-recognised World Fair Trade tartan has been registered by the Keeper of the Scottish Tartans Register in time for World Fair Trade Day and Fair Trade Fiesta events this May, as well as being part of their crowdfunding campaign. This new, vibrant and unique World Fair Trade tartan is the brainchild of Tania Pramschufer, director of Hand Up Events and founder of Fair Trade Fiesta and Parade. Working in collaboration with House of Edgar, textile designers behind the tartan, the well-known and distinctive Fair Trade colours of green and blue have been replicated in the woven design. Part of the Fair Trade Fiesta crowdfunding campaign includes a kilt reward – for a pledge of £800 – for one keen supporter who will receive an exclusive, bespoke Fair Trade tartan kilt hand-made by Cathy Hope from Edinburgh-based artisans - Braw Kilts. Commenting on the new Fair Trade tartan, Tania Pramschufer, director of Hand Up Events, said: “It is such an incredible honour to have been able to bring the World Fair Trade tartan and kilt project to fruition. This will create a lasting legacy for Scotland as a Fair Trade Nation whilst also supporting our WFTO members around the world. “I am also extremely happy to announce the very first World Fair Trade tartan products will be made and designed by Anak at Villageworks in Cambodia supported by Scotland’s World Fair Trade Organisation member, Eve Broads, from Fair Trade Scotland. Anak, director of Villageworks, said: “We are very excited to be part of this new venture, which will see the new World Fair Trade tartan, incorporated into their extensive range of bags and accessories from Cambodia. Eve Broadis, Fair Trade Scotland, added: “We are so proud to be launching a range of World Fair Trade tartan accessories from our Cambodian partner, Villageworks. Minister for International Development and Europe, Alasdair Allan, said: “The Fair Trade Fiesta provides an excellent opportunity for the people of Scotland to come together to celebrate our continued commitment to Fair Trade, whilst also raising awareness of the need to further support Fairtrade producers and help people in developing countries. Supporting the events Rudi Dalvai, president of the WFTO, said: “I am delighted to be coming to Scotland for World Trade Fair Day to wear a kilt made in the strong and deep colours of the new Fair Trade tartan. “The Fairtrade movement was launched more than half a century ago by people with strong social responsibility towards the weaker in the supply chain of international trade. “At that time, there was still a low level of public awareness about the exploitation of small farmers and workforces in developing countries producing products of our daily consumption. “Despite this, Fair Trade has become a success story, although the exploitation continues in many parts of the world. “Today, consumers have the possibility to choose products with the guarantee that they are socially and environmentally clean. Fair Trade Fiesta will be hosted by presenter and Fair Trade ambassador, Gail Porter, over the course of the weekend performers and celebrities will be celebrating and highlighting Scotland as a Fair Trade Nation on World Fair Trade Day, involving people of all ages and backgrounds. The aim of this event to raise more awareness on the Fair Trade movement through a vivid and vibrant parade and an engaging free concert with The Red Hot Chilli Pipers headlining and over 200 musicians and performers taking part to support this event, including: Cantara, Martin Aelred, Edinburgh Got Soul, Leanne & the Radix, Glasgow Gospel Choir, Pulse of the Place, Davidson Mains Pipe Band, One Tribe and Zuba. Fair Trade Fiesta is being organised by Team Fair Trade Fiesta, a voluntary group and part of Edinburgh based Hand Up Events, one of the UK’s leading ethical events companies that exists to platform and promote fair and ethical trade to mainstream. This project is using the Flexible funding open on Crowdfunder UK and will receive all pledges made. Pledge £100 VIP tickets to see the Red Hot Chilli Pipers! We have four PAIRS of VIP tickets to see the *Red Hot Chillis at the Alhambra Theatre in Dunfermline on the 30th of December 2017. This includes a meet and greet with the band. £100 is for one pair of tickets. Pledge £100 Be in the spotlight on stage with the Red Hot Chilli Pipers for a professional photo with 0405 Photography! Light refreshments included at the backstage VIP area. Pledge £50 Professional photo shoot with the Red Hot Chilli Pipers with Ross Band Stand and or Edinburgh Castle in the background at Fair Trade Fiesta. Photos taken by 0405 Photography. Pledge £800 BRAW KILTS – TAILOR-MADE, PERSONALISED KILT, VERY LIMITED EDITION With the impending LAUNCH Of the World Fair Trade Tartan; two personalised kilts exclusively tailor made by BRAW KILTS; woven by House of Edgar are on offer for rewards. Pledge £5 Greeting card with newly-launched World Fair Trade tartan on the front. Optionally signed by ether Fair Trade ambassador, Gail Porter, or president of the World Fair Trade Organisation, Rudi Dalvai (on the day). Cards to be collected from the front desk @ Fair Trade Fiesta Concert. Pledge £20 Professional photo shoot with the famous and stunning Scottish piper Louise Marshall, who has played with Brian May, for The Pope and most recently performed at National TV Awards. Pledge £50 Meet and greet Fair Trade Fiesta presenter, Gail Porter, at the backstage VIP area. Gail Porter, who is also a long-standing Fair Trade ambassador, broadcaster and journalist. Photos taken by 0405 Photography.